The Swedish jewel collection owes a serious debt to Josephine of Leuchtenberg (1807-1876), who married King Oscar I and became Queen of Sweden and Norway. Josephine’s amethyst and diamond demi-parure is one of the most impressive royal collections of amethysts, and it is still worn by the Swedish royal ladies today. It’s often said to have originated with Josephine’s grandmother Empress Joséphine, wife of Napoleon I. 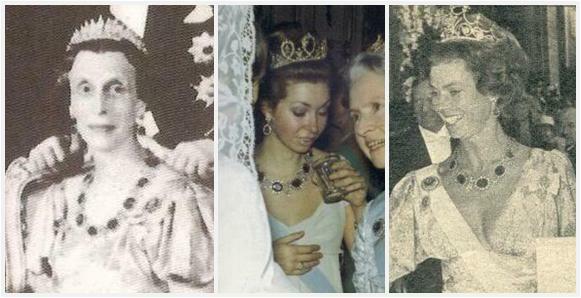 What we know today as the Swedish amethyst tiara was used as a necklace when Queen Silvia married into the family in 1976. Featuring large oval amethysts surrounded by diamonds and separated by diamond elements in the French Empire style, it was a cumbersome piece; as Silvia herself noted in the documentary De Kongelige Juveler, it was heavy and uncomfortable to wear. So she had a tiara made by adding the necklace to a frame, at once solving the problem of a too-heavy necklace and filling the hole left by the absence of an amethyst tiara in the royal collection. The change isn’t permanent, so the piece can still be worn as a necklace. The demi-parure also includes two bracelets which can be worn together as a necklace, two brooches, a pendant which can be suspended from the larger brooch or the bracelets when used as a necklace, and a pair of earrings. All of this is part of the Bernadotte family foundation, which means it isn’t any one person’s personal property; the necklace/tiara and other pieces from the set have been worn by multiple family members. Princess Madeleine made her debut in the tiara at this year’s Nobel ceremony, which tied in nicely with my little feature here. If you’ve read this blog for any length of time, then you will know that I have an uncontrollable weakness for all things purple. Obviously I had to have an amethyst tiara in my dream collection, but choosing one was quite a task. It pains me to say it, but it seems nearly impossible to find a truly excellent amethyst tiara. This one isn’t perfect - it can put the wearer at risk of squaring their head off depending on the placement of the tiara, and that’s never a good thing – but the stones. The stones! They are some of the most delicious amethysts around (and in a fictional scenario there’s nothing stopping a little reconfiguring, right? ), and that’s enough to earn a spot in my little group. 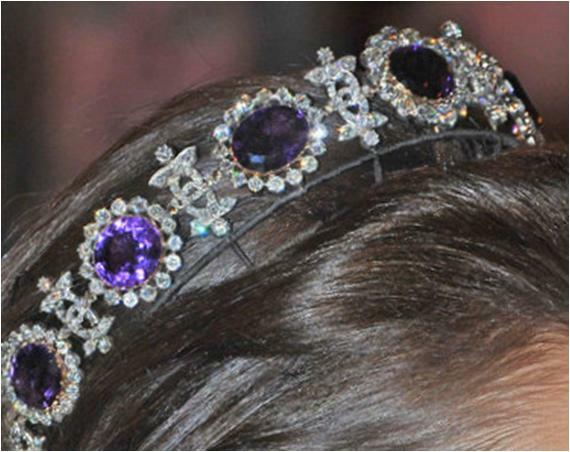 Is there an amethyst tiara in your ultimate collection? Which one?